With the Michigan election results now certified, Trump expanded his Electoral College victory over Hillary Clinton to 306 to 232. That’s a convincing victory, for sure, but it hasn’t stopped Trump from embellishing his victory. On Nov. 27, Trump tweeted that in addition to winning the Electoral College “in a landslide” he also won the popular vote “if you deduct the millions of people who voted illegally.” We found no basis for Trump’s claim about “millions of people who voted illegally” and whether that swung the popular vote in favor of Clinton (who currently leads the popular vote tally by more than 2 million votes). But what about the claim of a landslide victory? The following day, Kellyanne Conway, Trump’s former campaign manager and now a senior adviser to the president-elect, used similar language — “landslide” — to characterize the 306 electoral votes won by Trump. And Trump again used the term later the same say in a tweet criticizing CNN for reporting — correctly — that Trump’s claims about illegal voters swaying the popular vote to Clinton were baseless. But it turns out that the percentage of electoral votes won by Trump, 56.9 percent, is hardly a landslide by historic comparison. “It’s just not true,” Pitney said of Trump’s “landslide” boast. Pitney told us in a phone interview that while there’s no legal definition of landslide, such a victory should have to at least be in the top half of electoral wins. “And this doesn’t come close to that,” Pitney said. 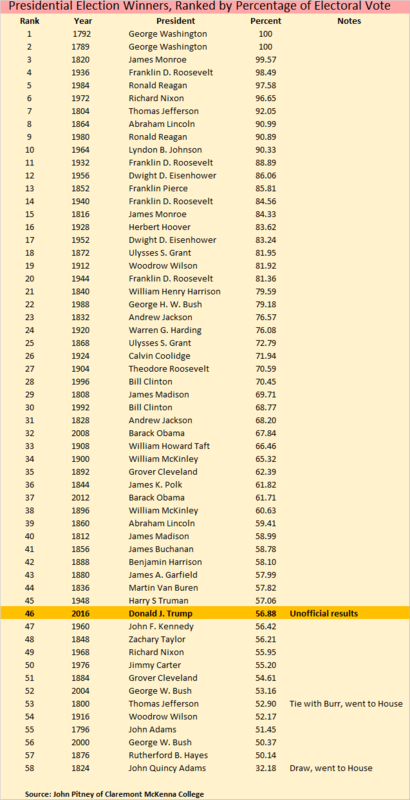 George Washington tops the list, having carried 100 percent of the electoral vote. But one need not go so far back in history to see true landslides. Ronald Reagan carried 49 states in 1984, garnering him nearly 97.6 of the electoral vote. Richard Nixon also carried 49 states in 1972, winning 96.65 percent of the electoral vote. “Those were landslides,” Pitney said. Trump’s margin of victory in the Electoral College is greater than George W. Bush’s in 2000 or 2004, but both of those were among the tightest electoral victories in American history. To this, we will add the disclaimer that these calculations assume Electoral College electors on Dec. 19 will vote according to who won a plurality of votes in their state, and that recounts will not overturn any of the state results.